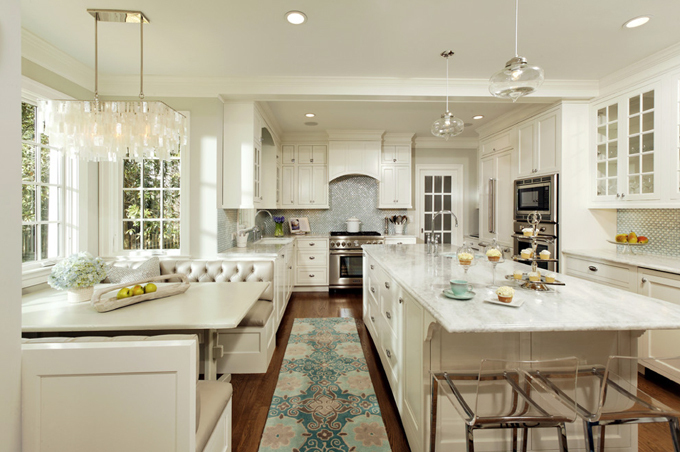 Virginia Kitchens + Harry Braswell Inc.
Wow, this kitchen! I cannot handle how much I love it!! 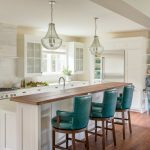 The entire home was renovated by Harry Braswell Inc. out of Alexandria, Virginia, who worked with designer Erin Hoopes of Virginia Kitchens to create the dreamiest kitchen ever, as well as the the custom millwork throughout the home, photographed here by Greg Hadley. I think the turquoise rug got my attention first, I’ve been wanting that one forever. 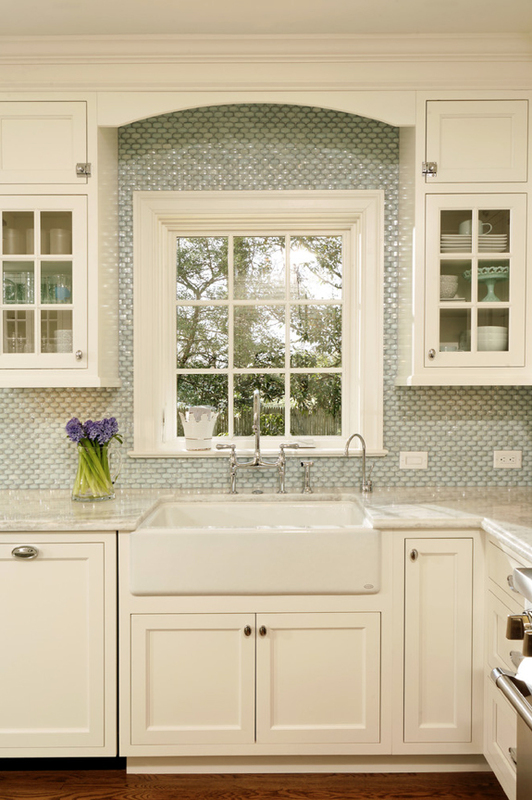 Then the shimmery aqua backsplash (from Susan Jablon Mosaics, but no longer stocked on their site), it’s just so pretty! And of course the capiz chandelier (since I’ve wanted that forever too) above the darling banquette. But did you see the little turquoise sink?! I didn’t even know I wanted that forever! So much to love!! 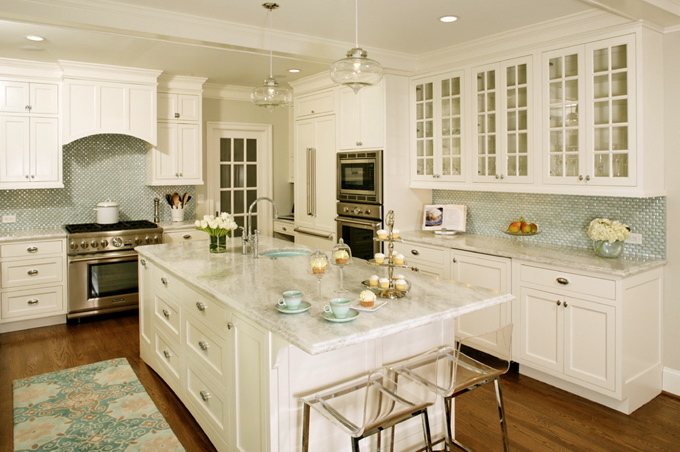 Check out more amazing kitchens from Virginia Kitchens right on over here! 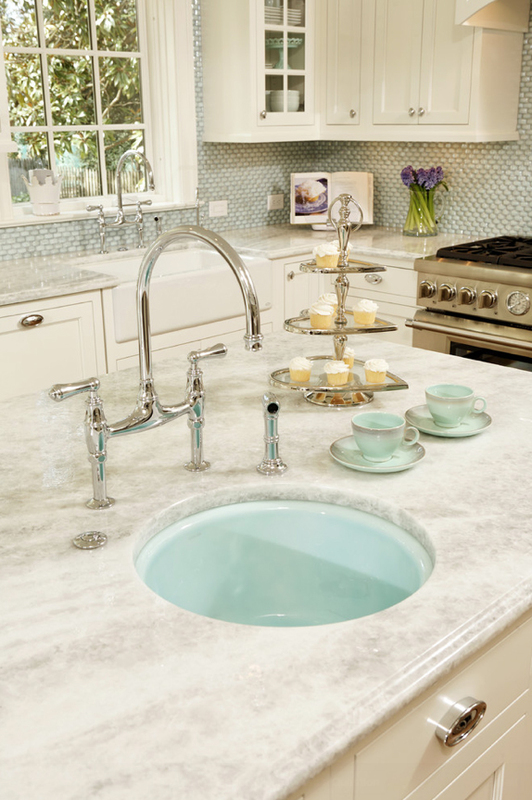 Turquoise sink: from Kohler in “Vapour Green.” Sadly discontinued! One of my favorite kitchens that you have featured! 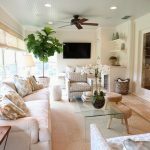 Any idea as to the lovely paint color on the walls? Now THAT is a stunningly glamorous kitchen. That sink! Those lights! But how do they keep the rug clean? Mine would be filthy in a week. Maybe they don't have three kids running around….. If I had the opportunity, I'd have that kitchen in a second! Gorgeous! I wonder if that house is in my neighborhood, as both Braswell and Virginia Kitchens are…if so I hope the homeowners nominate themselves for the next Del Ray House Tour, as I'd love to see it in person! That is the most awesome kitchen I have ever seen. I want it…I want it!!!! Such a stunning kitchen; I absolutely love the colors!! Wish this was my home! Thats what I said too, When I was scrolling down looking at this gorgeous kitchen. WOW!!! Thats not even a kitchen. There are no words to describe it. Stunning. When I win the lottery, that is the kitcen i am going to have. That is hands down, one of the most gorgeous kitchens I've ever seen. Holy crap…I'll never get it out of my head!! yes, definately agree with the other comments – one of the best kitchens I've seen you feature. Would also love to know the colour paint on the walls? Thanks for the constant inspiration, you're one of my daily reads! I my goodness! This is beyond beautiful. It would have to be favourite kitchen I have ever seen. Thank you for sharing it with us, I'm going back to staring at it for a while longer. Very beautiful! I love the rug, I'm so glad you linked where it's from…I might have to start putting some money aside to get that baby! I cannot believe that sink – what an elegant touch! 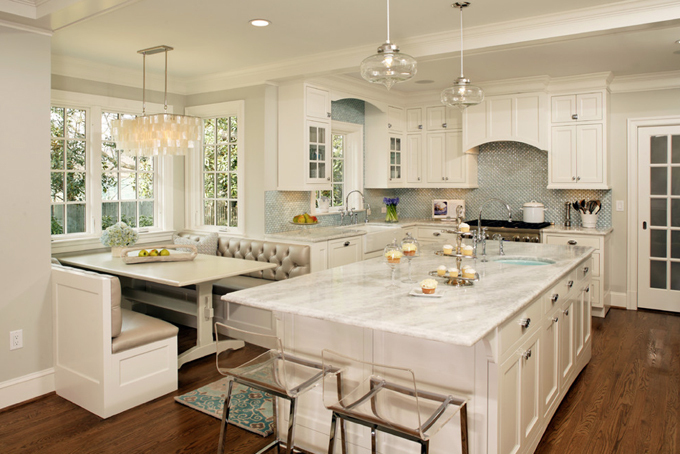 This kitchen is beyond gorgeous. You couldn't get me out of there with a wad of C-4! I love that there are 'regular' touches therein, amongst all the custom work, there's a relatively acquirable Garnet Hill rug! This is an incredible kitchen. Thanks so much for sharing and the inspiration. We're in the planning phases for our new kitchen and this gave me some great ideas…..I just need to figure out how to do it affordably! 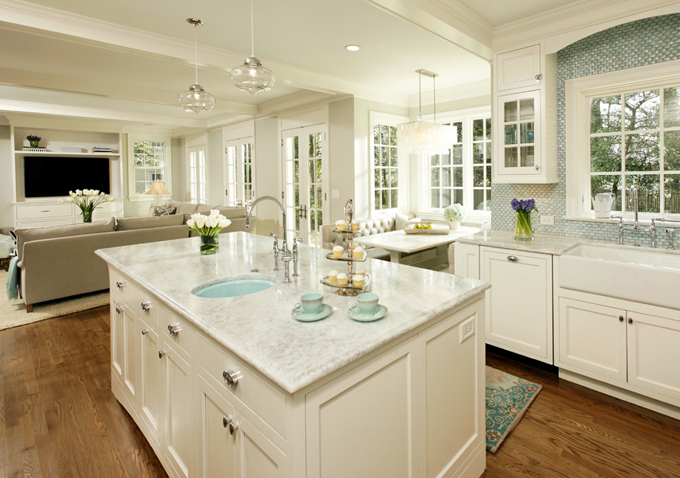 I love this kitchen and the paint color! I emailed Erin regarding the color and she was so gracious to reply back. 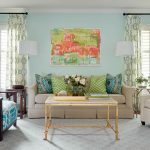 The color is Benjamin Moore grey owl – low VOC paint. Gorgeous! I fell in love with the turquoise zinc! Do you happen to know the manufacturer/brand? love it all! 😀 Thanks! This kitchen is now #1 on my dream list! It has every element I adore and desire. Thanks for posting it! That turquoise sink!! And the window shot are my favorites! Love the latches on the upper cabinets. Wow, what a kitchen! I love it. Does anyone know what colour those cabinets are? I always have so much trouble with whites – there are so many to choose from!! The tile is gorgeous !!! There are so many on her site. Do you at least know what the color could possibly be. So many blue shades to pick from. About the tiles, they are an iridescent milk glass tile in a basketweave pattern. The cabinets and trim are painted Benjamin Moore "Snowfall White." Walls are painted BM "Owl Grey". Thank you so much, Erin! Your site is heavenly; I can (and do) spend hours clicking away! I love those countertops! Could they be granite or are they marble? Do you have any information on the counter top? Marble, granite, quartzite, name?